"Kamby Bolongo Mean River," Robert Lopez's hypnotic second novel, is the story of a young man whofinds himself confined and under observation, the subject of seemingly pointless tests. His only link to the outside world is a telephone that will not dial out. During the occasional calls he receives, usually wrong numbers, the narrator remembers his former life growing up in Injury, Alaska with his Mother, an often unemployed single parent, and his older brother, Charlie, a sometime boxer, sometime actor. Throughout the course of this extraordinary novel, the unwilling captive draws his life-story in stickfigures on the walls. From the difficulty of his birth, to his sickly childhood, to adventures with his brother, the narrator depicts his crazy life, which is at once fascinating and heartbreaking. The one memory that haunts him is that of watching a movie about slaves on television and how that one slave, the one for whom Kamby Bolongo Mean River meant freedom, would never relinquish the idea of returning home. Darkly hilarious with a crushing emotional impact, "Kamby Bolongo Mean River" is a brilliant study of familial bonds and trauma, isolation and captivity, hope and hopelessness. 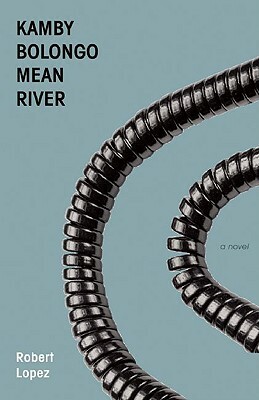 ""Kamby Bolongo Mean River" is an original and fearless fiction. It bears genetic traces of Beckett and Stein, but Robert Lopez's powerful cadences and bleak, joyful wit are all his own." --Sam Lipsyte, author of"Home Land "
"In "Kamby Bolongo Mean River" damage and delusion walk hand in hand, and everything we think we know is gradually called into question. Reading like a cross between Samuel Beckett's 'The Calmative' and Gordon Lish's "Dear Mr. Capote," Robert Lopez's new novel gets under your skin and latches on." --Brian Evenson, author of "The Open Curtain"
Robert Lopez is the author of Part of the World, a novel from Calamari Press. His fiction and poetry has appeared in dozens of journals, including; Bomb, The Threepenny Review, The Mississippi Review, Indiana Review, New England Review, New Orleans Review, Blackbird, Nerve, etc. He teaches at The New School in New York City.